WASHINGTON—In an effort to address concerns about the affordability of coverage, Republican congressional officials advised Americans Monday to set aside the income from one of their jobs to pay for healthcare costs under the newly introduced American Health Care Act. “Under this bill, you would simply set up a separate savings account for the total earnings from one of your jobs, which will ensure that you can comfortably cover your healthcare expenses each month,” said House Speaker Paul Ryan, adding that the GOP’s proposed Affordable Care Act replacement would keep healthcare costs for the average American from exceeding the entire salary of one full-time job. “If you budget things correctly, you’ll have plenty of money left over from your other job or jobs to spend on food, rent, and any other personal expenses. In some cases, healthcare will even be low-priced enough to afford using only the income from a part-time side job on the weekends. 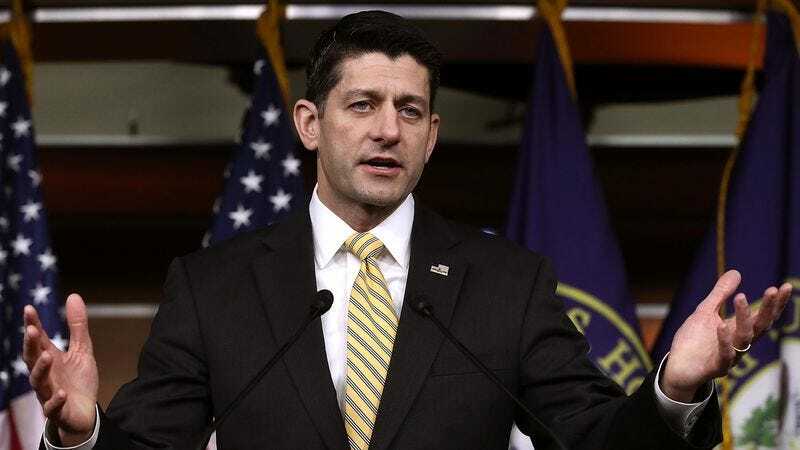 The important thing here is that this legislation will allow Americans—not the federal government—to decide for themselves what kind of healthcare they want and how many jobs they choose to have in order to pay for it.” Ryan also recommended that in order to be prepared for the added costs of a sudden medical emergency, Americans should create a dedicated savings fund using the money from at least two of the mortgages on their homes.